You know when you have a light bulb moment? I was scrolling through my blog posts and I realised that I have never really talked about why I love London so much. Living in Bromley makes me pretty lucky because I am 20 minutes away from Victoria so I can always get to London pretty quickly. I thought it would be quite nice to write about my favourite things to do in London, whether I am having a date night with Ollie or having a food session with the girls. I've kept this list pretty budget friendly too but I will do a jazzier and expensive version soon but personally, I do love this list - you don't need to spend a fortune in London to have a great time. Let me know what you think of my picks and what your favourite London activity is! I am far too excited about London Dungeons, I have been going here for years and I never get bored of it. If you are looking for something fun, engaging and educational - this is my favourite place to go. Okay, this aimed at a younger audience but I still find it entertaining and I love hearing about the gruesome historical facts from the gunpowder plot and also Jack the Ripper! I am heading to a karaoke bar this weekend for my friend's birthday, this is such a guilty pleasure because none of us can sing but plied with gin and tonic and we will be singing for hours. Like I said, this isn't the most glamorous activity but we will be laughing for hours and we will also enjoy lots of Chinese food while we are there. You can find quite a few karaoke bars around London and it is even better if you can hire a private room. I actually took Ollie here for our second date. This is my favourite cinema ever because I have such lovely memories here. What makes the Prince Charles Cinema so special? They play old movies! Ollie and I watched Die Hard on our second date and it was pretty lovely to relax and sit in red, leather seats while drinking fruity beer and watching a 90's classic. They even show sing-a-long films too - Grease 2 is a cool shout if you want something retro and different. I was lucky enough to visit the BFI IMAX when they were showcasing film memorabilia, they hosted an auction this week but you could have a peek at the display and see actual film props. 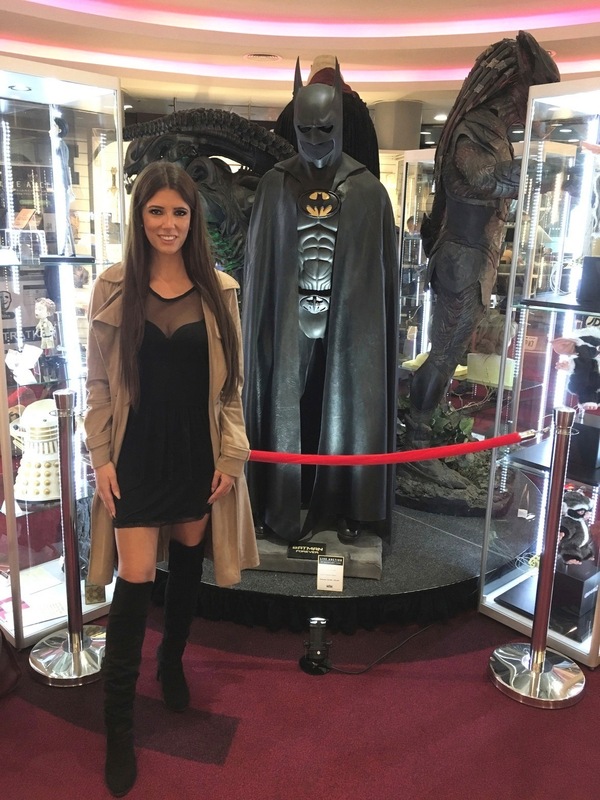 We all know I am a massive Batman fan so I had a huge fan girl moment when I took a photo next to the 1995 Batsuit. It was free to enter and walk around so we spent the morning taking photos and looking at very unique film props, from James Bond weapons to Terminator 2 props. If you are a big movie buff like me, London always has film events on - Time Out is a great place to scroll through if you are looking for film events. On our way to the Electric Cinema in Notting Hill (another amazing and retro cinema house) we usually stop off at the vintage markets and I always find a gorgeous collection of fur coats to try on. If you are looking for jewellery or vintage tops from the 80's or 90's - London markets are always a treat. This is a budget friendly option because most museums in London are free! Ollie and I have been to quite a few and we are pretty big history nerds. Whether we are looking at dinosaurs or looking at inventions at the Science museum, we have ticked it off our list. You can fit a whole day of museum trips by starting early and the gift shops are a good stop if you love unique stationery too.